FRESNO, CA. 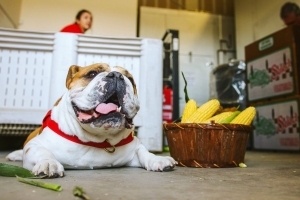 (KMJ) – Fresno State has record opening-weekend sales for their sweet corn. 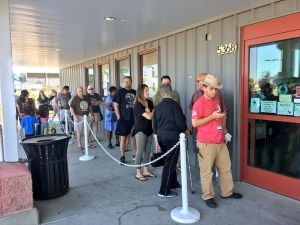 On Friday, June 8, the official opening day, Central Valley customers bought 36,980 ears. It was the second-highest opening day sales ever (slightly behind last year’s opening day record of 38,586 ears). 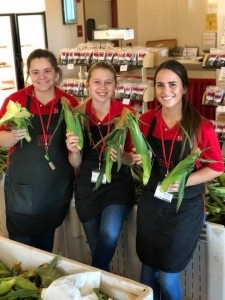 The Rue and Gwen Gibson Farm Market at Fresno State sold 160 bins of sweet corn over the weekend, or 80,766 ears (49,486 ears of yellow and 31,280 ears of white). That beat last year’s opening weekend record of 78,473 ears. There was no lack of customers and no dip in corn sales for Fresno State, even after some believed the recent Randa Jarrar controversy would have an affect. Some callers voiced their opinions on the KMJ talk shows, speaking of boycotting the corn, but their feelings did not materialize in any harm to sales. Betsy Juergens was the first customer in line on Friday, arriving at 4:30 a.m. before the market’s 7 a.m. opening. The sales figures include 5,671 ears sold during a soft launch on Thursday, ahead of the official opening day. Fresno State’s Bulldog Victor E. Bulldog offered facts and trivia. In honor of National Corn on the Cob Day, I thought I’d share some fun facts about Fresno State’s famous sweet corn with you. 1.Depending on the heat, Fresno State corn takes about 80 days to grow from seed to harvest. 2.Two full-time staff members and a number of student workers are responsible for the 82 acres of corn. 3.Fresno State’s first corn crop was grown on campus in 1981 and sold in 1982 at the former farm market on the corner of Chestnut and Barstow. 4.In 2017, Fresno State harvested 800,000 ears of yellow and white corn combined. That’s a lot of corn! 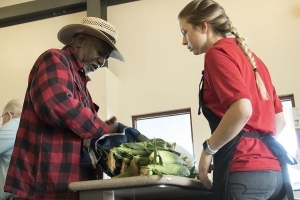 5.Fresno State corn is harvested during the coolest part of the morning and delivered same day to the Gibson Farm Market in order to ensure optimal freshness.